Protest in Milwaukee against the Israeli ambassador to the U.S. | Fight Back! Outside the building where Dermer was giving his address, a group of 70 protesters gathered with flags, signs and megaphones. 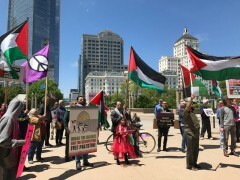 The demonstration was organized by several local groups, including Jewish Voices for Peace-Milwaukee, Peace Action Wisconsin, and the U.S. Palestinian Community Network-Milwaukee. A few of the participants managed to gain access to the event to give cues to the protesters on the outside. Those listening to the address communicated when the ambassador was speaking and whether or not they could hear the chanting from the outside. Demonstrators were pleased to hear that their messages were loud and clear and had a definite impact on the atmosphere of the room. Samir Moukaddam, a Milwaukee activist leader and co-organizer of the protest, said that the Rotary event was set up in an effort to protect the Israeli ambassador from any kind of criticism from the community. At one point during the protest, several of the organizers handed out flyers with the names of the Palestinian martyrs who have been killed by the Israeli occupation since the beginning of the Great March of Return on March 30. A few protesters read the names of the slain and the rest of the group chanted in unison “We remember you!” directing their voices at the building so the ambassador and his audience might hear. Ambassador Dermer made an effort during his speech to try to connect Milwaukee to the growth and development of Zionism through the person of Golda Meir, who served as Israel’s fourth prime minister from 1969 to 1970. 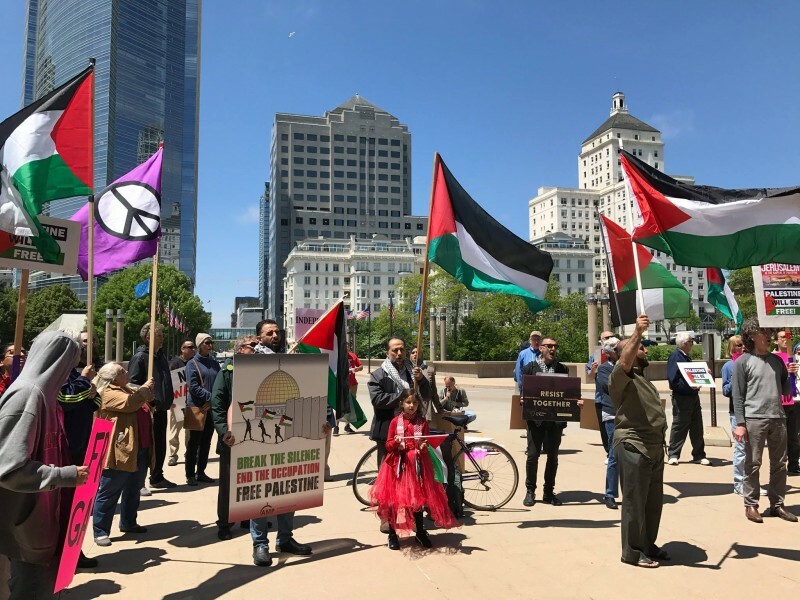 However, if this demonstration was any indicator, the people of Milwaukee reject wholesale the genocidal apartheid regime in Israel and stand in full support of the Palestinian people in their struggle for liberation.